I am completely new to Dolphin. I would like to play Monster Hunter Tri (a game that should support a classic controler) on the emulator. And i would like to play this with an Xbox 360 controller. Is this possible? can anyone give me proper instructions to do this? If i configure the GCpad with the controller and just run the game it won't work. GCPad is for Gamecube controllers. 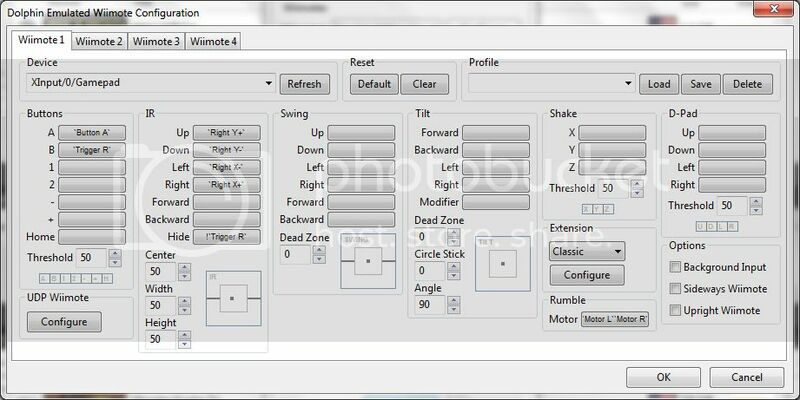 You should set up a Wiimote (with or without the Classic Controller) by going to Options -> Wiimote settings. I tried anything but I don't get it to work....even the profile doesn't work for me I can't use nunchuck to point at mobs to add them to your hunterlog. I use an xbox360 controller. I did trust me...but then the nunchuck aint working (Z+aiming) and you realy need it. Aaaand you didn't listen. CLASSIC CONTROLLER. I.e. not wiimote and nunchuk. M8....I know, am not an idiot has nothing to do with not listening. I have been reading a lot and I know I need to pick CC. But when I take classic controller and map everything, then ingame I cant use Z+targeting (that you need to point at the mobs and add them to your hunterlog the Z button works but targeting aint possible). I played around also with the ingame options but that didn't solve it. I might be missing something but its far away from not listening. *edit* I added a screenshot. *edit* same for Zelda....I use the premade .ini for xbox controller...it doesn't work either. (11-29-2013, 06:33 PM)kotor Wrote: M8....I know, am not an idiot has nothing to do with not listening. I have been reading a lot and I know I need to pick CC. But when I take classic controller and map everything, then ingame I cant use Z+targeting (that you need to point at the mobs and add them to your hunterlog the Z button works but targeting aint possible). I played around also with the ingame options but that didn't solve it. I might be missing something but its far away from not listening. Maybe its too late to post this but i manage to solve that problem while searching for a Metroid Other M controller config. The way it works is that for targeting you need to hold RT and then move the right stick. If you have any problems let me know.